St. Petersburg Yacht Club is part of SAILING Champions League since 2016 and hosts Qualifier 3 on river Nieva in the iconic historical heart of St. Petersburg. The sailing conditions in the city centre with lots of wind shifts and strong current make this semifinal the most difficult place to win at. Racing in front of the historical background of the previous Emperor’s capital delivers a fascinating feeling for once in a life time experience. The regional public sport organization Saint Petersburg Yacht Club was established in 2007. Its main mission is to maintain the ideals of maritime culture on land and on sea and to develop nautical sports, as well as to grow enthusiasm for sailing. The Yacht Club’s philosophy is based not only on necessity to preserve but also on a commitment to transfer to future generations the Russian nautical cultural heritage, along with Russian and world maritime history. PJSC Gazprom is a global energy company. Main areas of focus are geological exploration, production, transportation, storage, processing and sales of gas, gas condensate and oil, as well as generation and marketing of heat and electric power. Gazprom Company actively supports the development of sport, including sailing. 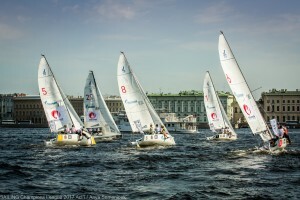 PJSC Gazprom and Saint Petersburg Yacht Club organise a series of children’s sailing races “Optimists of the Northern Capital – the Gazprom Cup”; they organise the international offshore race along the route of “Nord Stream” pipeline, Nord Stream Race, and implement other sailing projects as SAILING Champions League.